Training lures such as a dog training treat or toy can help promote desired behavior; your poodle doing what you want him to do when you want him to do it. You move the treat so your poodle follows it with his eyes, face and body. This encourages him to move in a certain way or direction and teaches him tricks or commands. Once he does the desired command, make sure to lovingly and lavishly praise him, say "good boy" a few times then give him the toy or treat as a reward. As your pooch learns the trick, behavior or command he is rewarded each time with the dog training treats and praised. Be sure to praise and reward and have fun. If not, your pet gets bored and training becomes a chore. He learns that training is fun, pleases you and he gets a prize! Keep training periods short and scatter them throughout the day. Implement training into play and fun time with your pooch. If you're training your dog to sit, have her sit before she's fed or have her sit before you go for a walk or throw a ball for her to fetch. Don't forget to reward her for sitting! She'll equate training with fun and won't get bored or refuse to comply. Eventually you can stop the constant rewards. 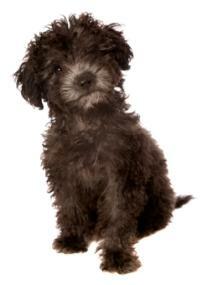 Your poodle will want to please you, and will continue doing the commands, tricks and behaviors she learned. It doesn't hurt to lavish affection and say "good girl" when she does them, though or reward her occasionally! Should you discipline and punish your pet? 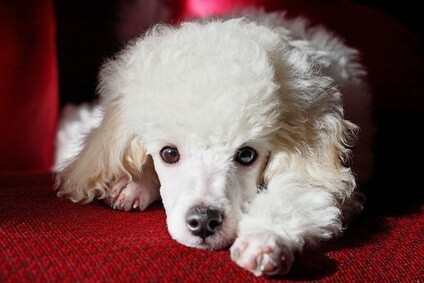 Poodles, especially young puppies, are going to have potty accidents and make mistakes with unpleasing behaviors. Punishment can affect training adversely and make her see you as the bad guy. 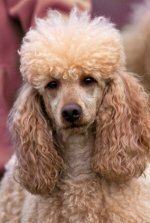 It may offer good behavior while you are with your poodle - she knows to do the right thing because you will scold her, but it may exacerbate the problem if you are not home. Your puppy knows you aren't there to scold her misbehavior and the punishing tactics are only making her unwilling to comply with authority. So when you're not there, she'll do what she wants since you're not there to punish her. You can also do clicker training on your pooch using a clicker (or a ball point pen which clicks) and positive reinforcement. You'll need treats, too. You click when you want her to do a command and give her a treat after she does it. To get her used to positive reinforcement, click then give her a treat then repeat so she associates the clicker with a treat. You train with a clicker by luring with a treat, watching her and when she begins to do something you want click and treat, and when she gives you a final result you click and treat. When she does the action (final result) say the name of it. Your poodle will remember the name and will be able to do the action when you say the name. 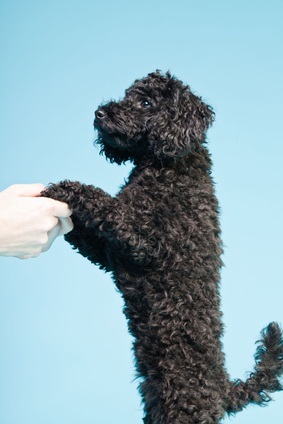 A dog training treat reinforces positive behavior in your pet. It gives her something she really likes. When she likes something, she'll want to do whatever it is that made you so happy you gave her a treat.